M ost people make the pilgrimage to San Diego to play beach volleyball in cutoff jeans, publicly serenade high-ranking military officers, and ultimately dominate the skies. Unfortunately, in the intervening years since the debut of Tony Scott’s military musical Top Gun, the film’s namesake program moved to Nevada. To soothe the souls of the inevitably heartbroken, San Diego has subsequently seen an explosion in outstanding places to grab a drink. 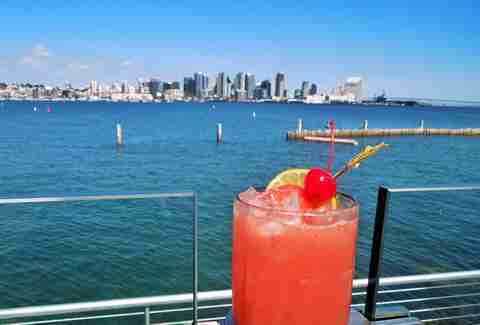 You can still find your way to legendary local bars like Starlite and Waterfront, but this list covers the bars you simply gotta try that let you know you're in San Diego, including a video-game lover’s paradise and a sanctuary for vegan death-metal fans. So after you're through annoying the staff at Kansas City BBQ with your rendition of "Great Balls of Fire" (it still has the piano! ), settle for dominating the Skyys at the watering holes below. Your reliable stop for music, dancing, and all-purpose weirdness: If you're at all worried your trip won't be memorable, this is a great place to start, or end, your night. The divey venue books entertainment seven nights a week and is walking distance from a ton of good options when you're ready to move on. Some nights will see new or up-and-coming acts; others will welcome regular DJs for such parties as Motown Mondays and Rat Sabbath Sundays. 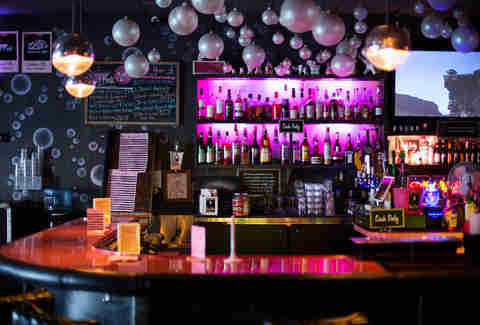 Unsurprisingly, given that it's in North Park, Bar Pink has a super-diverse, hipster-leaning crowd that can completely change from night to night. What doesn't change much is the lean cocktail list and beer selection. If you need to shake things up, go for cocktails at Seven Grand and URBN (also home to some delicious New Haven-style pizza) just a couple blocks away. And if the entertainment runs too esoteric for your tastes, check out the lineup at the Casbah near the airport, or Solana Beach's Belly Up Tavern for increasingly mainstream shows in intimate venues. An intimate tequila refuge with creative food: If you're hankering for some tequila in the Gaslamp, La Puerta is the spot to go to. Known for incredible margaritas, unpretentious Mexican food, and a solid daily happy hour (plus a late-night happy hour six nights a week), this little agave hideaway is tucked just off the main drag, giving it a much more personal feel than many downtown bars. A favorite happy hour spot among locals, the bar is close enough to the thick of things to catch a lot of straggling tourists. 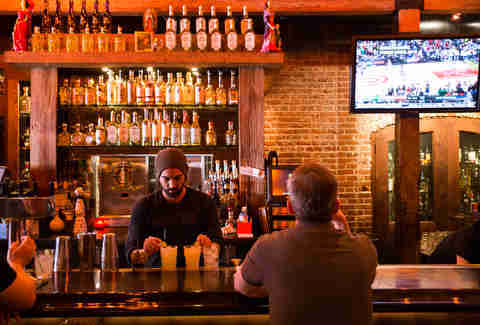 In addition to a lineup of nine signature margs, the bar's slinging beer, wine, more than 100 tequilas, and house cocktails like the Bad Medicine with Fortaleza reposado, mezcal, ginger syrup, and fresh lime. As for food, it whips up all of the classics, plus some playful takes like carnitas and pancakes and the TJ Dawg, a bacon-wrapped turkey dog topped with grilled onion & poblano, jalapeños, ketchup, and mayo. A beer-and-pizza standout even in a beer lover’s paradise: After his third victory in the Great American Beer Fest’s Alpha King Challenge (a contest to see who can make the hoppiest yet-still-drinkable beer), Jeff Bagby decided to hang up his Pizza Port brewing apron in favor a new pursuit: opening his own beachfront brewery with his wife, Dande Bagby. 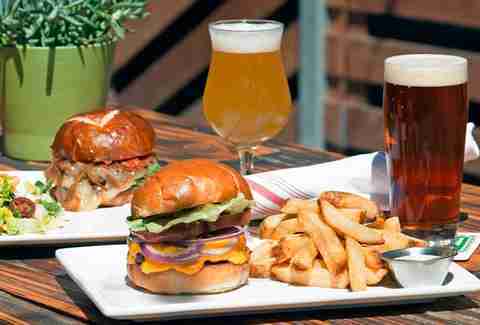 The duo also sprang for a two-story restaurant that, combined with those in the brewery's tasting room, brings the complex's tap count to nearly 150. They also serve up cocktails, including a meticulously made margarita that was served at their wedding. The food is incredible, but, frankly, it's all just prelude to desserts like bread pudding with Bulleit rye salted caramel and an espresso/mint chocolate chip/bourbon butter pecan gelato ice cream sandwich sampler. While it's pretty far north, Oceanside is close to LEGOLAND and Camp Pendleton, so expect a nice mix of locals, off-duty military personnel, and families with really smart parents. 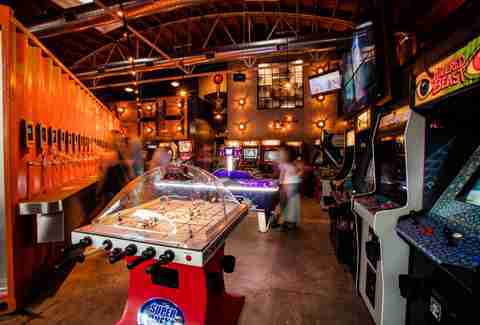 The neighborhood bar for pinball and lavish brunch: The perfect place to act like a local while sipping on one, Harbor Town pub is a friendly little dive just a couple of blocks off the bay near Fisherman's Landing and Point Loma Seafoods. The crowd ranges from neighborhood locals holding down their favorite barstools to groups of weekenders on pub crawls. On top of a great lineup of local beers, it mixes up approachable classic cocktails and ups the bar food game with selections like bulgogi nachos with kimchee and a flank steak take on the California burrito. For the brunch bunch, there's an unlimited mimosa/Bloody Mary deal on the weekends that is guaranteed to get your day started off on the right, wobbly foot. It also recently expanded with a game room featuring a huge mural depicting what appears to be really stoned sea life, plus seven pinball machines. 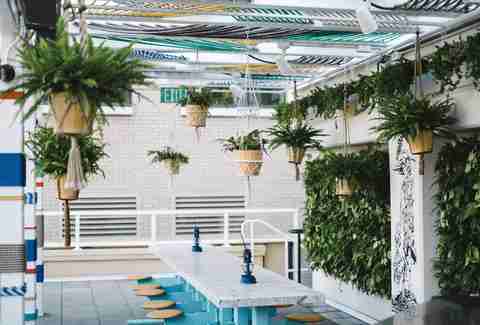 If you find the place a little upscale for your tastes, head down the street to Club Marina, where you're much more likely to be pegged for the outsider you are. The taste and feel of authentic Mexico: True tequila-heads will want to make a pilgrimage to Cantina Mayahuel in the upper reaches of North Park. 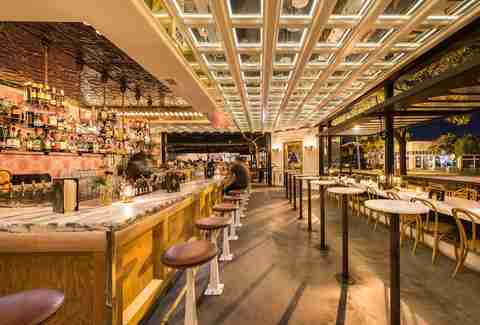 This drinking hole that looks like something out of an early Robert Rodriguez film has one of the city's most impressive agave spirit collections in the city, at more than 200 bottles. The cuisine includes limited-run specials of regional favorites, and the expert staff has got you covered with pairings. 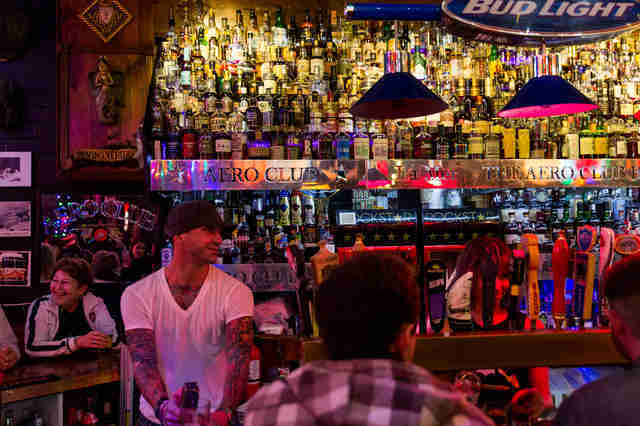 Off-duty bartenders typically outnumber tourists in this industry favorite. A dazzling Tiki speakeasy with high-octane drinks: Craft & Commerce recently completed a massive renovation that added new seating, a new bar, and more spectacular taxidermy. The culinary homage to all things literary is still covered with quotes and strewn with books, but the entire space feels more cohesive, downright grown-up: Expect a more mature, discerning crowd that won't mind the complete absence of vodka. Also, it added a magical walk-in fridge. What should be an area off-limits to customers is now a disturbing portal (past bar essentials like citrus, cucumbers, and, uh, skulls in jars) to a cave filled with the best Tiki drinks imaginable. 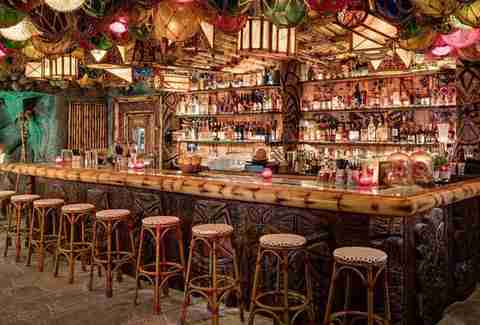 The space is transportive, with a waterfall wall pocked with torches and skulls, overhead pufferfish, and wall-to-wall Tiki art. The bar itself is a glass display featuring 15 menus from San Diego's storied Tiki past. 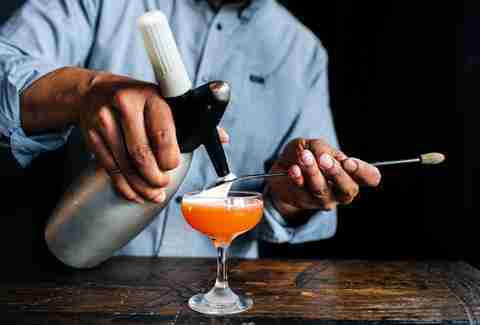 True to their tradition of teaming up with the industry’s best (Sam Ross for Noble Experiment, Phil Ward for Craft & Commerce), the crew developed an ambitious menu with Tiki legend Martin Cate of Smuggler's Cove fame. The result: 36 insanely complex signature cocktails, including takes on all of the classics as well as a pair of shareable cocktails meant for four, served in a giant flaming Tiki basin. Fine meats, cocktails, and open-air views: Another twofer from the crew behind Craft & Commerce/False Idol, Rare Form and Fairweather are stacked adjacent to Petco Park. Downstairs, Rare Form is an immaculate take on the modern European deli with house-cured meats and a unique, brandy/schnapps-focused bar program designed by proprietor, and San Diego cocktail scene legend, Anthony Schmidt. To see Rare Form in its namesake, check it out on game day. It's a favorite among Padres fans who want to enjoy a tipple before heading into Petco, the land of $15 beers. Upstairs, Fairweather is a massive patio overlooking Petco Park that serves a sort of greatest hits cocktail menu that draws from the group's other locations along with a slew of new unique signatures. Whichever poison you end up picking, both levels will mitigate it by serving Rare Form's delicatessen menu. A self-service ode to the golden era of arcade gaming: Perfect for introverts who need a couple brews to get social, this corrugated metal "beercade" has more than 30 games that range from classics like Excitebike and Altered Beast to a few modern bits like the four-player Pac-Man Battle Royale. While you may have to wait in line to play Michael Jackson's Moonwalker, it's ensured you'll never wait for a bartender by converting a giant shipping container into a self-service, 50-tap kegerator of sorts. Accessible by the same wrist-worn key fob that you use to access the video games, the taps pour a wide range of brews, wine, cold-brew coffee, and even kombucha. The best part? It's 21-and-over, so you won't be getting schooled by any school kids. And since it's in La Mesa, you won't run into many other tourists unless it's during Comic-Con. A fanciful restaurant with a reputation for great cocktails: Since it's a little tough to stumble upon, The Lion's Share is a top choice among locals on hectic weekend nights. 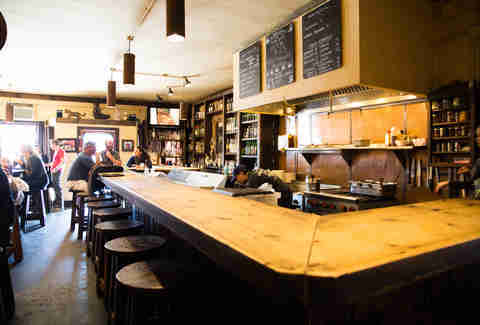 Find this rustic-leaning lounge just far enough off the beaten path to escape most visitors, but easily walkable from the Gaslamp and Little Italy. 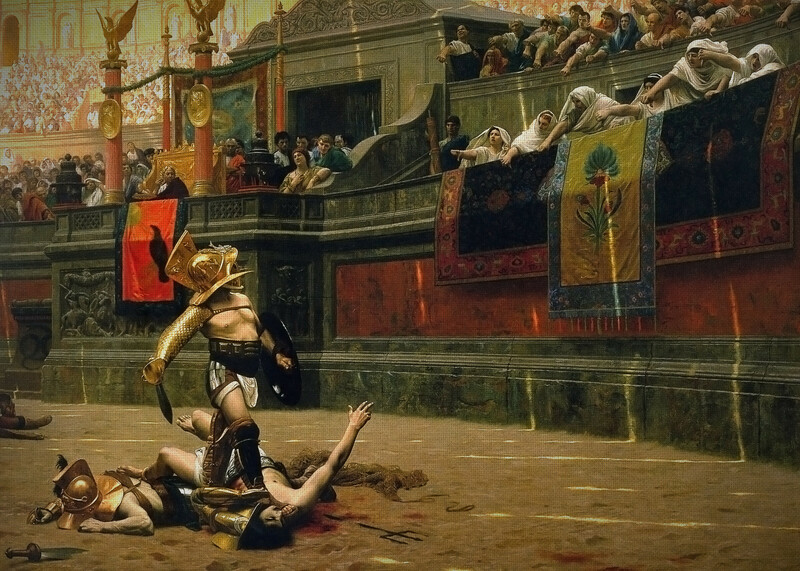 The cozy, lodge-esque interior is adorned with classic artwork playfully defaced by local artists -- think Jean-Léon Gérôme's famous gladiatorial scene, Pollice Verso, with the victor brandishing a bunny mask and carrot in place of his gladius. The decidedly gamey menu is loaded with great cocktail companions like boar sausage poutine with white cheddar and bison tartare with fried capers and fermented chilies. The extensive cocktail menu covers all of the classics, as well a wide range of house creations like the Federal Buffalo Stamp with bourbon, lemon, ginger, and maple syrup. 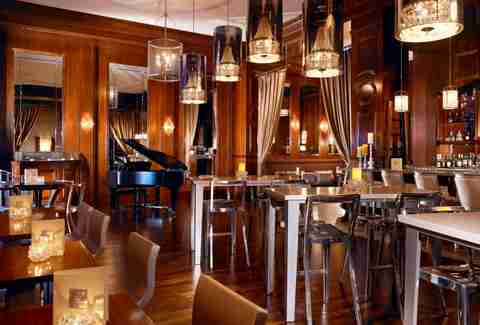 An elegant, historical lounge with a talent for patient cocktails: This swanky, Art Deco landmark is popular amongst the business crowd and those who know that some of the best cocktails are found in unlikely places. Set in the US Grant Hotel, which Ulysses S. Grant Jr. opened in 1910, the bar started pouring libations relatively recently -- in 1952. For years it didn't allow women in the bar past 3pm, a slight that San Diego women addressed with a 1969 sit-in that won them the inalienable right to rock 'til dawn. Now all party people can snub their noses at proprietors long past while sipping on signature mainstays and exclusive treats like the US Grant Centennial Manhattan -- an eminently smooth, barrel-aged (for 100 days!) Manhattan, bottled in collaboration with Utah's High West Distillery to celebrate the hotel's centennial. If you're in a rather baller-ish mood, the bar also offers a trio of "billionaire" cocktails like the $30+ Bulleit 10 Year Old Fashioned. 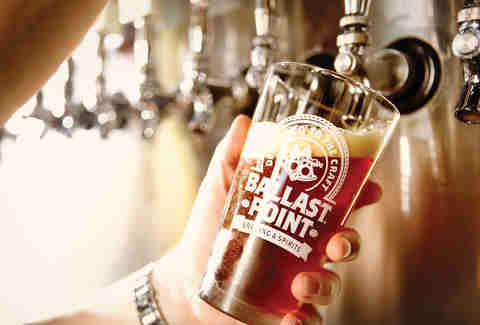 The home of sublime craft brew test batches and great pub fare: If you can't make it out to the new main brewery in Miramar, swing over to Ballast Point's Little Italy outpost for the latest and maybe greatest. The location focuses on R&D, brewing small batches that run the gamut from potential money-makers to off-the-wall collaborations. To help you with your research, the location offers a seasonal food menu several cuts above typical brewery fare, and growler fills and bottles for homework’s sake. If you're feeling adventurous and/or sacrilegious, you can even spice up your brew with the house Mai Tai or Bloody Mary spice blends. The layout is big and wide open, so it's popular for large parties of locals and tourists alike. The place does serve beer, but for brews you probably want to head next door to the locally famous Hamilton's Tavern, which has 30 curated taps, tons of craft bottles, a proper jukebox, and bar games like pool and foosball. If a member of your party is dangerously low on iron, or cheese, San Diego's best Neapolitan-style pizza is across the street at Buona Forchetta. An innovative mainstay with an epic whiskey list: Intoxicating pilots since 1947, the Aero Club is the best bar in town for whiskey lovers. As if a legendary collection of more than 800 bottles wasn't enough of a draw, the knowledgeable staff is led by bar manager Chad Berkey, co-author of The North American Whiskey Guide from Behind the Bar. 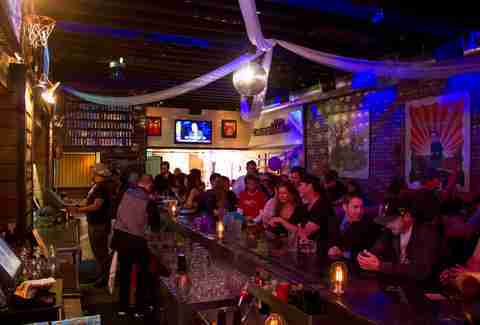 In front of the bar the upscale dive rocks plush booths, two pool tables, and arguably the best jukebox in town. For non-purists these guys will happily mix up a few classic-leaning signature cocktails. Aficionados will likely want to take advantage of the curated whiskey flights, which, unlike those taken by the pilots who opened this joint, are dangerous only for you. Because you won't make it through the bible o' bourbon in one sitting, pre-scope the whiskey menu and be prepared to scroll for days. It takes effort, or at least willpower, to get to Aero Club, so the only out-of-towners you’ll likely find there are devoted whiskey hounds. Elegant cocktails with excellent views and Mexican cuisine: Once upon a time there was a huge riverboat called the Reuben E. Lee that, after years of dilapidation following a successful ~20-year stint as a floating restaurant, was destined for a multimillion-dollar restoration by some master restaurateurs. But when they towed it away for repairs, the rat-infested hulk disintegrated and sank. For the better, perhaps. In its place now stands the crown jewel of the Cohn restaurant empire, rather than a campy riverboat restaurant. 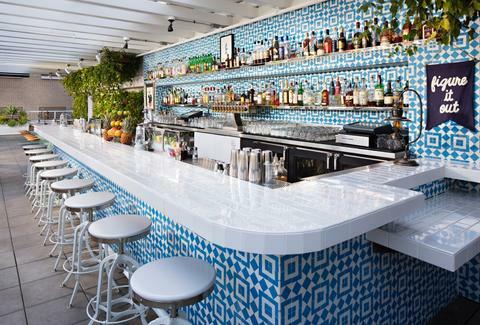 Coasterra has the best views of the San Diego skyline over the bay, an impressive bar program, and delicious modern Mexican cuisine to soak it up. The bar stocks 100+ agave spirits (including exclusive, single-barrel selections aged to Coasterra's specs), 16 signature margaritas that cover every taste, and more spirit-focused 'tails like the delightfully smoky Oaxacan Old Fashioned. In all, Coasterra serves as a great upscale spot to bring a date, but probably isn’t the best spot to find one, as it's a little isolated on the tip of Harbor Island. It doesn't take reservations for the patio (which covers about 80% of the seating) but with floor-to-ceiling windows throughout, there really isn't a bad seat in the house. If the wait is excessive, your built-in backup plan is Coasterra's sister restaurants, C Level and Island Prime, right next door.